Harry Huffaker, an inductee in the International Marathon Swimming Hall of Fame, had been alternatively training for additional open water swims and traveling solo in his recreational vehicle in the state of New Mexico. Unfortunately, his trip was interrupted by a stroke/brain bleed. "Without warning, I began to experience slurred speech and mental confusion. After friends called Emergency 911 and an ambulance ride to the emergency room in Truth or Consequences, New Mexico, I was lifeflighted across the New Mexico desert and taken from there by another ambulance to the Intensive Caru Unit in El Paso." 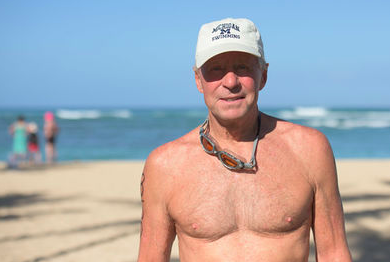 After eight long days, the famed Hawaiian channel swimmer was released. "I flew to Albuquerque where newly found friends had kindly shuttled my van and left it at the airport." But his health challenges were not over. "After another event, I spent a few more days at Lovelace Heart Institute which is a world-class facility and then returned to [hometown of] Ketchum [Idaho]. Since the problem was caused by blood thinner, a full recovery is expected." His most recent CT (computerized tomography) scan indicated that his brain bleed is resolved. But his marathoning mindset continues. "Balance has been somewhat of a problem, but that also continues to show improvement. Last week, I hiked up the ski hill with the aid of hiking poles from 6,000 feet to the summit of 9,100 feet. I am doing some weight training 3-4 days per week, but I had to put the Waikiki Roughwater Swim on the back burner until next year. I will head to the UM Cardiovascular Center to undergo a procedure to implant the Watchman Device which should obviate the need for me to be on blood thinners. Quite a few a number of masters swimmers have Afib (or atrial fibrillation, an irregular, often rapid heart rate that commonly causes poor blood flow) and are on blood thinners which work well for many, but not everyone. This Watchman Device procedure might be of interest to other swimmers [see here]. Once again, the swimming community offers further proof that there is not another sport which offers the level of connectivity, camaraderie and lasting friendships than swimming does. My teammates from club swimming 65 years ago, high school swimming 60 years ago, college swimming 55 years ago, and open water friends from 50 years ago in Hawaii have all stepped forth to offer assistance in several ways — emails, phone calls, airport pick-ups, shuttles to and from various places, lodging, hospital follow-up, etc." Photo above by Mike Lewis of Ola Vista Photography shows the-then 75-year-old Dr. Huffaker preparing for a crossing of the Molokai Channel in Hawaii.